This shop has been compensated by Collective Bias, Inc. and its advertiser. All opinions are mine alone. #WelcomeToFamilyNight #PeterRabbit #CollectiveBias. 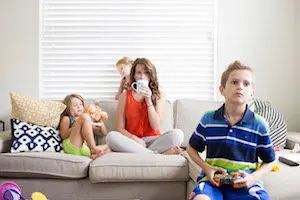 A few weeks ago, I shared about how our family has a weekly tradition of Family Movie Night. It’s something we look forward to every week, whether it’s an old throwback movie from my childhood, or we treat ourselves to a new movie. Most times, it’s an excuse to veg out. Sometimes, we have fun taking our movie night to the next level. A few months ago our family saw Peter Rabbit in the theaters. It’s one of the rare family-friendly movies our whole family has seen and unanimously loved. 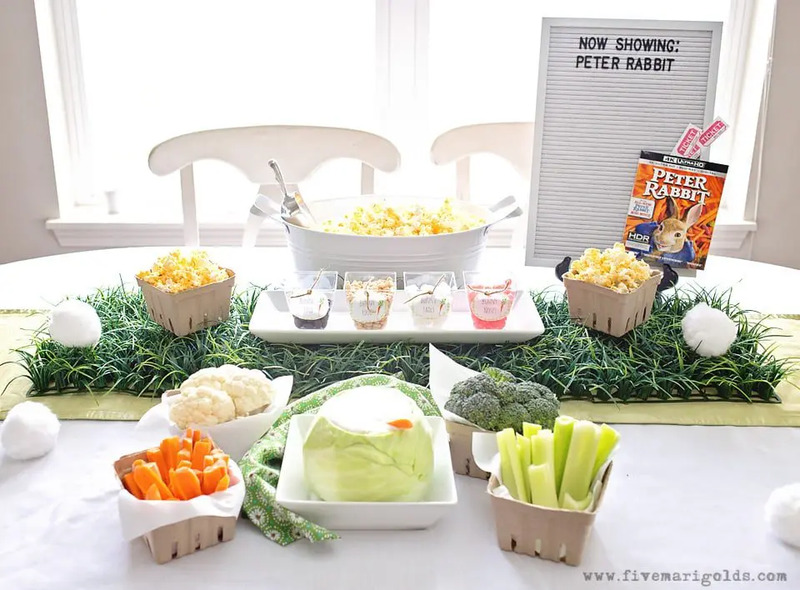 So, when it hit stores this week, I picked up a copy and planned a little Peter Rabbit party, complete with a Bunny Bar and minute to win it games. 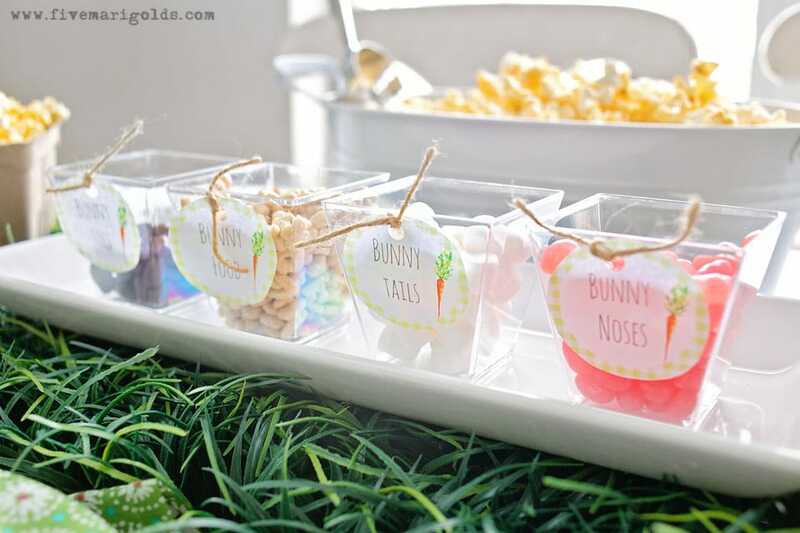 I thought it would be cute to create a Bunny Bar, with a few popcorn mix-ins: Bunny Noses, Bunny Tails, Bunny Food, and Bunny Toes. Otherwise known as: jelly beans, marshmallows, cereal, and chocolate covered raisins. Note to self: put out fewer mix-ins next time. The kids get a little overzealous. 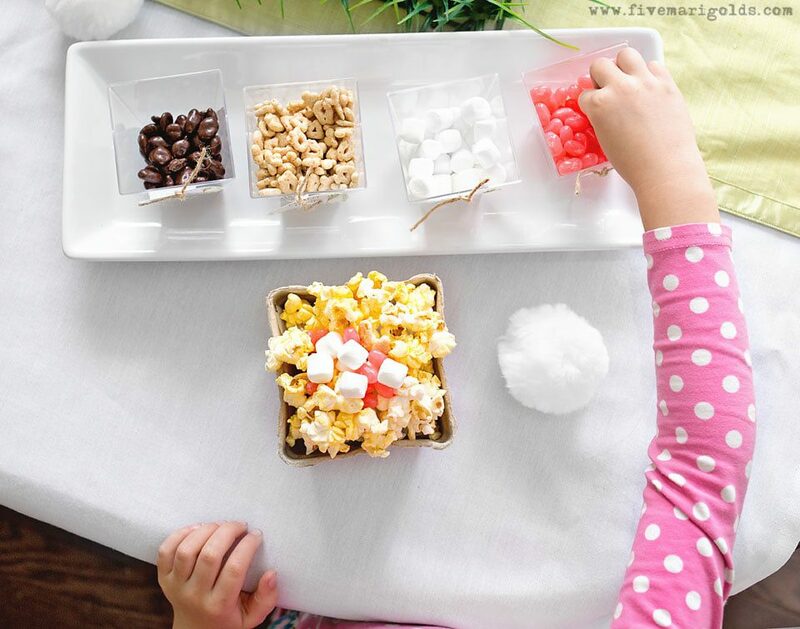 For dinner, I like to keep it super simple on these Movie Nights, so I treated the kids to one of their favorites. These easy Kid Cuisine meals are always a home run – I always know I’m choosing a meal that will satisfy my kids. You can choose from a range of kids’ all-time favorite dishes, many with full servings of vegetables – which is a huge score for us busy moms! 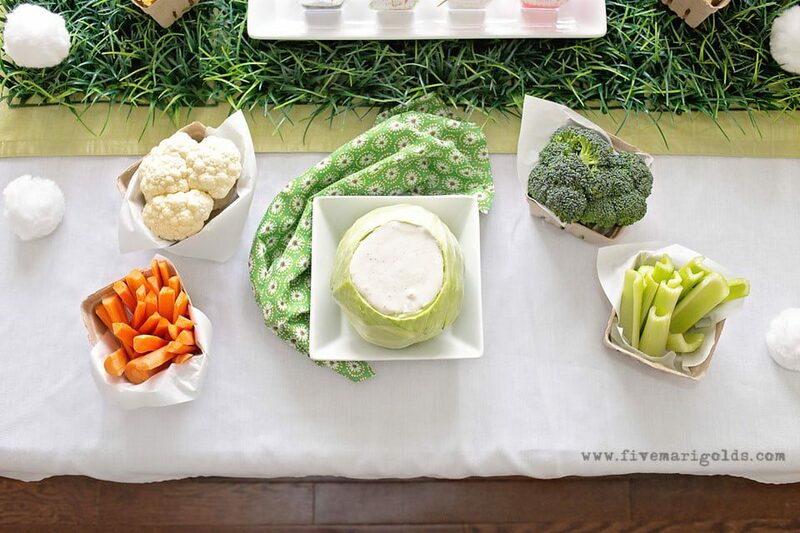 For good measure, I also created this cute veggie bar. My mom research tells me presentation is everything when it comes to the healthy stuff. I love serving food in berry baskets, because it somehow seems more special and festive than a bowl. Plus, I just always wanted to make a dip bowl out of a head of cabbage. How cute is that? For our opening act, we had fun with some bunny themed Minute to Win it Games. 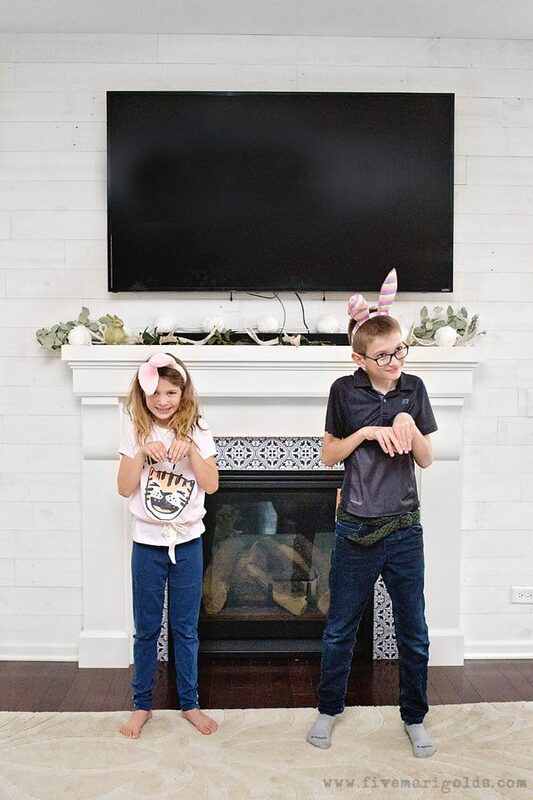 Shake Your Bunny Tail: We used some empty tissue boxes threaded with a belt and ribbon for a fun (and funny) party game. 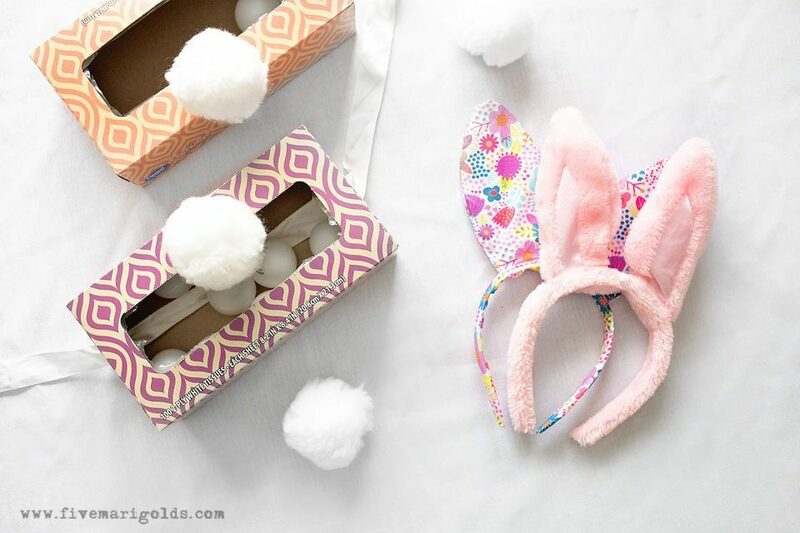 I stuck a fluffy white pom to create a bunny tail, and filled the tissue boxes with ping pong balls. 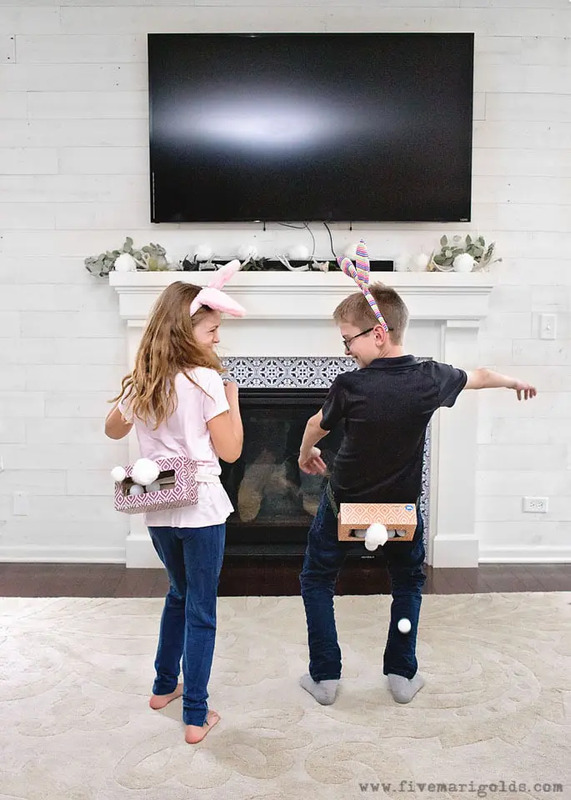 With their feet firmly in place, they have to shake their bunny tails to see who can get the ping pong balls out of the box the fastest. This game always gets a lot of laughs! Sir Hop-A-Lot: This game is just as it sounds – see who can hop the most in one minute! All you need is a pedometer or a smart phone for this game. Place it in each participant’s pocket and start hopping! Whoever has the highest count at the end of one minute wins. We actually attached the pedometers to our bunny ears for more of a head bopping game instead of true hopping, but this is a little intense so we only did it for 30 seconds. Either way is fun, but if you are prone to dizziness, the hopping in place is your best bet! 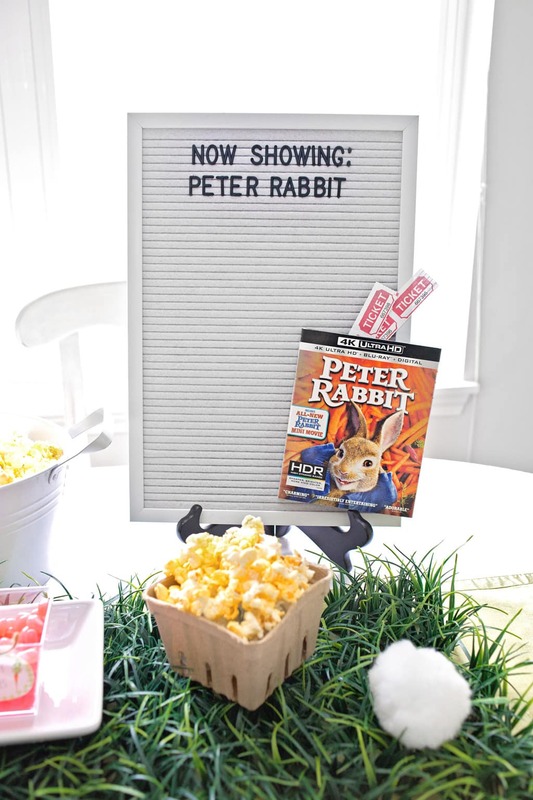 Whether it’s a family movie night during the week, or celebrating a special event like Mother’s Day, Peter Rabbit is a fun movie for the whole family. 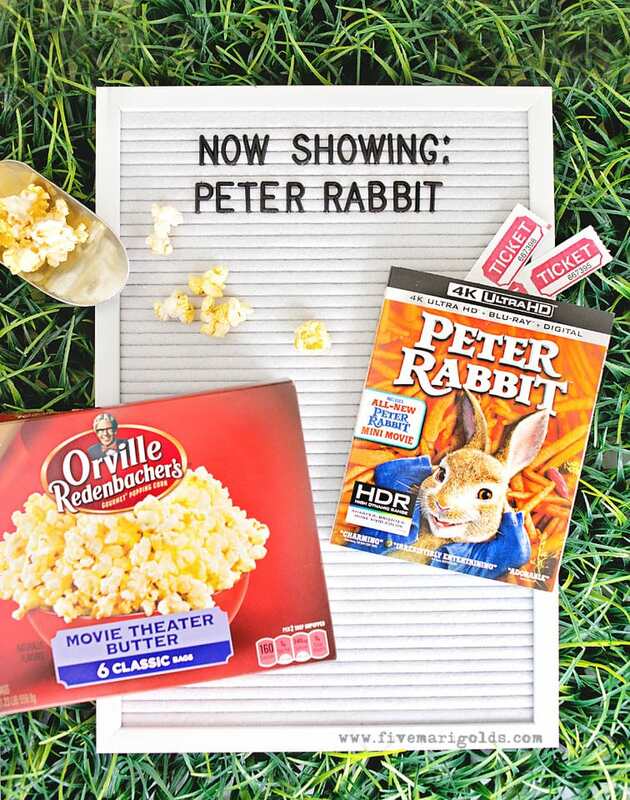 Be sure to hop by Walmart to get a copy of Peter Rabbit, and all your favorite movie snacks and Orville Redenbacher’s popcorn. *Select products contain real butter. See package for ingredient details. How adorable!! 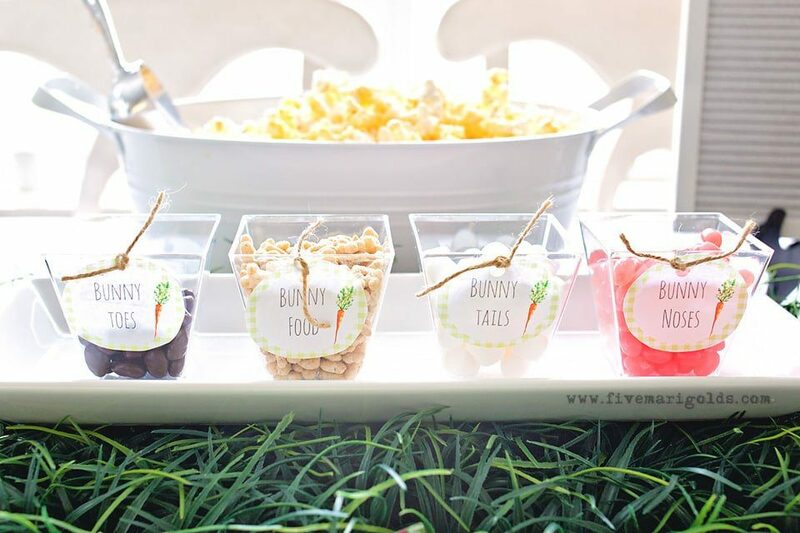 I love how easily you can incorporate healthy snacks into this! 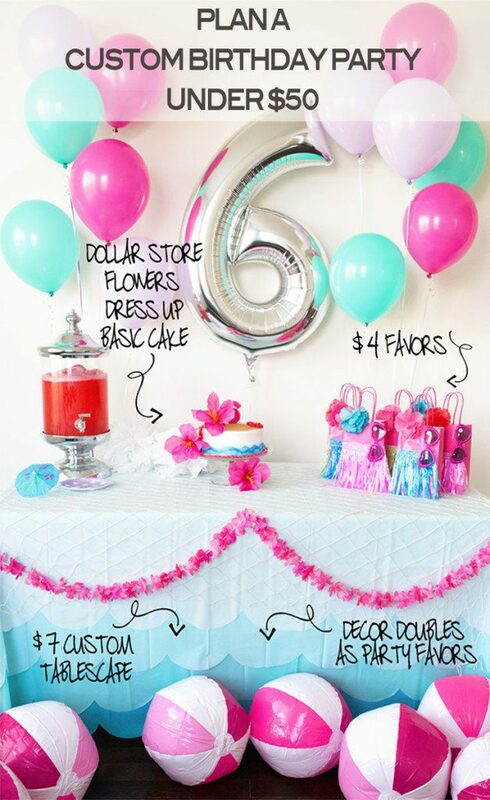 This seems like a fun family night idea! How fun! 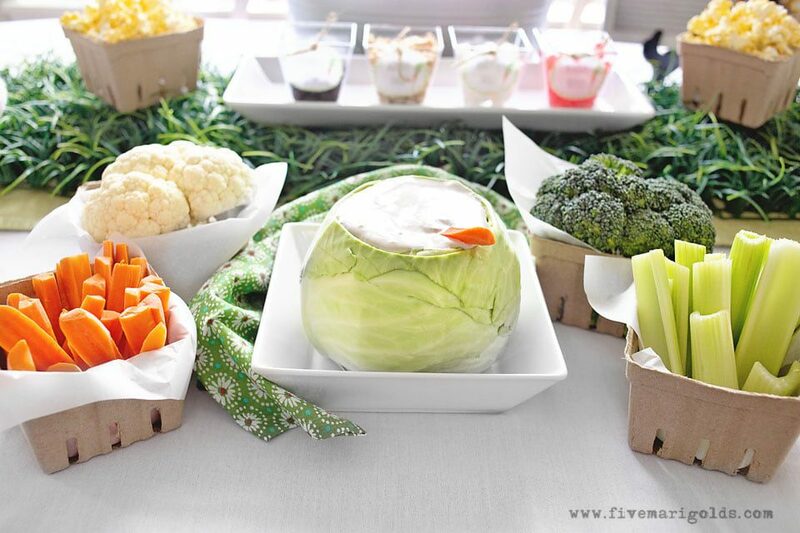 What a great idea for use of berry baskets and cabbage head ! Using this for my next gathering ! Love the creativity! Looks like a fun night ! Thanks !